EE is almost ready to launch the UK’s first 4G network, having already revealed the phones and the switch-on date, leaving citizens waiting for the most important details of all — how much it would all cost. Today, EE has published its 4G LTE tariffs, so for the first time we can judge whether it’s affordable or prohibitively expensive. The good news is that it’s all very easy to understand, as EE have made the tariffs all about the data that’s included each month, instead of complicating things with calls and SMS. 500MB per month will cost £36. These are all for 24-month contracts, although if you only want to sign-up for 12-months, you can add another £10 per month to the above costs. The 500MB plan obviously gives EE a good base figure to advertise, but sensible users will want to look at 1GB or more if they’re going to grab an EE 4G plan, as high speed data tends to disappear quite quickly. Once you’ve chosen your tariff, you’ve got to add the price of a compatible phone. EE offers the Apple iPhone 5, the Samsung Galaxy S3 LTE and the Note 2 LTE, the HTC One XL and the Huawei Ascend P1 LTE. Nokia’s Lumia 820 and 920 will soon be available too. The cheapest option will be the Huawei P1 Ascend, which is free on all but the 500MB package, where it’s £19.99. A 16GB iPhone 5 is £179 on the same plan, but only £19.99 if you go for the 8GB per month tariff. Choosing the 1GB per month tariff at £41 means the 16GB iPhone 5 will be £109, the Galaxy S3 and the One XL £49, and the Galaxy Note 2 a hefty £139. Buyers wanting to grab a 4G iPhone 5 will be pleased to know it works out at £5 extra per month over Orange’s standard 3G tariff. Here’s a comparison with an equivalent US 4G contract. According to AT&T’s website, a 1GB data plan with unlimited calls and texts gives a monthly charge of $85 and a $199 (plus tax) charge for the phone. EE charges £41/$65 per month and £109/$174 (no tax) for the iPhone, and doesn’t have an activation fee either. For all tariffs above the 1GB plan, EE will provide either 19 live streaming TV channels, a music streaming service or two free game downloads each month, plus on all tariffs, there will be a free film download each week until February next year too. 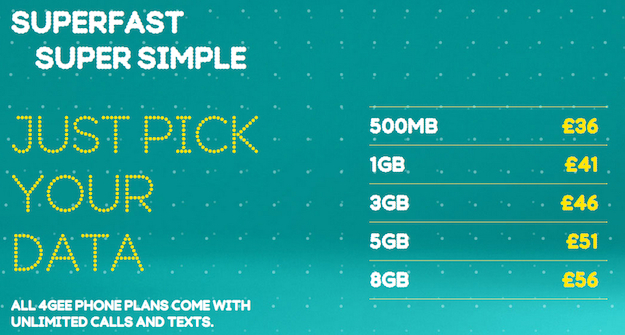 Finally, EE offers a SIM-only plan that starts at £21 per month, and gives Orange and T-Mobile subscribers the chance to swap their 3G phone for its 4G equivalent, and move to a 4G plan, all for £99. EE will turn on its 4G LTE network on October 30, when it will be available in Birmingham, Leeds, Bristol, Liverpool, Cardiff, London, Edinburgh, Manchester, Glasgow and Sheffield.